Las Vegas—January 07, 2014—Double Robotics, Inc. today announced at the 2014 International CES that the charging dock accessory for the Double telepresence robot is now available for pre-order through www.doublerobotics.com. The charging dock is compatible with all Double robots that have been previously purchased. The dock charges both Double and the attached iPad simultaneously. 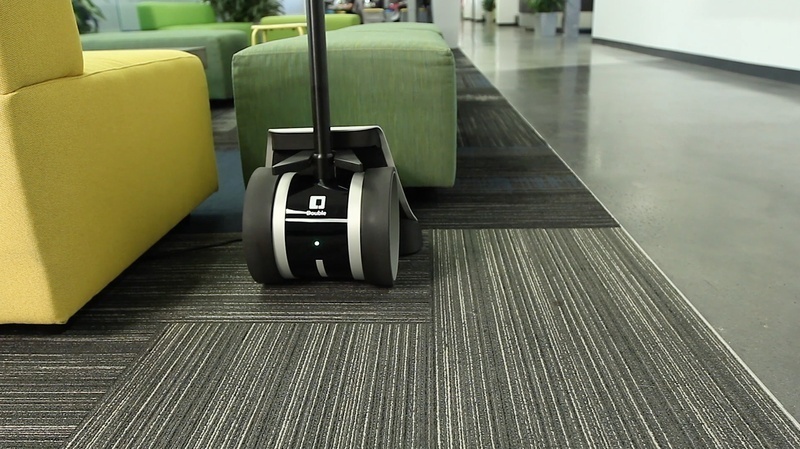 A video demonstration of the dock is available on the Double robotics website. A new iPad mount that supports iPad charging will be standard on all new units and included with a dock purchase free for customers with legacy iPad mounts. The docking station is sold for $299 and will begin shipping in February 2014. Double is part of the Apple Made for iPad Program and is compatible with iPad 2, iPad (3rd generation), iPad (4th generation), and iPad Air. Greetings. Does the charger function if the Double "backs" into the charger? Thanks. Yes, it charges if you drive in forwards or backwards. Can the user drive a charging Double away from the dock? That'd be awesome. Yes, the driver can remotely drive out of the dock too! We'd like to program a "home" button so that the Double drives itself back to the charger by keeping track of where it has been and/or using fiducial positioning. Do you guys provide an API to do something like this? Rafael, we do have an iOS SDK that you're welcome to use (https://github.com/doublerobotics/Basic-Control...), but I don't think there's enough data provided in the SDK for what you're looking to do. However, "dead reckoning" like that usually only works over short distance, so get the kind of accuracy needed to auto-dock. We'd love to see what you come up with, though. Thanks for this, we will check out the SDK. We are currently developing an AR app that tells smartphones their position and orientation by tracking known fiducial markers in the space with their camera. This we hope could compensate for drift and inaccuracies in other tracking methods. We will use the Double in a Museum and we want to be able to just tell it to go to exhibit x or y without having to drive it there. (BTW I'm sure other people are working on this and if they solve it before us then we'd be happy to deploy their solution). That sounds great - let us know how it goes! Rafael, you can access the camera feed in the normal way you would on any iOS device. The SDK simply provides access for an iPad to control the Double base unit over Bluetooth. Additionally, if you want to create your own remote driving experience, you can incorporate a third-party video solution, such as OpenTok (www.opentok.com). However, you'll probably want to use the highest resolution video possible on the local feed, if you're doing computer vision. Hello, can I modify my existing (old) iPad head mount so I can connect it to the power supply of the robot? Can I obtain the USB-wiring that you use in the new head mount so I can build it in the old head mount myself? @Bart, unfortunately, that's not possible. However, if you decide to purchase a Charging Dock, we will send you a free Charging iPad Mount with it, so you'll have the complete solution. If you don't want a Charging Dock, we can sell a Charging iPad Mount separately. Email support@doublerobotics.com and they facilitate either scenario. ok, sounds fair enough. What is your current lead time (if I'd order a Changing dock now, when would it be ready for shipment)?